The Apulia Region of Italy is an interesting region to me in several ways. The spelling of the region for one is interesting because two ways are considered to be acceptable, the one I use Apulia and the other Puglia. You can find a lot of information on the region using either, however when looking for maps of Apulia for a long time the majority of the maps would say Puglia. Only in recent years have maps started to appear with Apulia on them. Apulia is called the boot heal of Italy since it is the part of Italy that looks like a boot heal. The region has an area of about 7,474 square miles has 258 towns with a population of about 4,092,000. The capitol city of Apulia is Bari which is located about midway up the east coast from north to south. very long coastline of about 520 miles. It is well known that most of Italy is covered by mountains but the only mountainous area of the Apulia region is in the north and north western part of Apulia and unlike most of Italy there isn't much in the way of snow skiing in the region, There are some ski areas around but not in the abundance of the other regions. Outside of this small area of Apulia the rest of the region if relatively flat and use for growing crops. The capitol city of Bari is the most popular in Apulia and some of the other popular cities to visit are, Taranto which is on the north west coast, Leece, Brindisi, Monopoli, Trani and Barletta which are all on the east coast and Andna and Foggia which are just a little inland from the eastern coast. 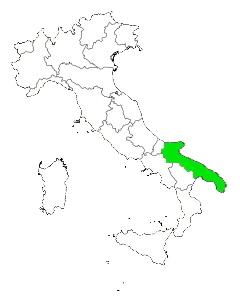 Apulia shares its borders with three other regions of Italy and they are Molise to the north and Basilicata and Campania which are both to the west.